publish in Images on November 22nd, 2011 by Demon | Report This Post | Click to Add to favorites | Tags: Humor, Science! haaaaaaaaa… very nice find, Demon! 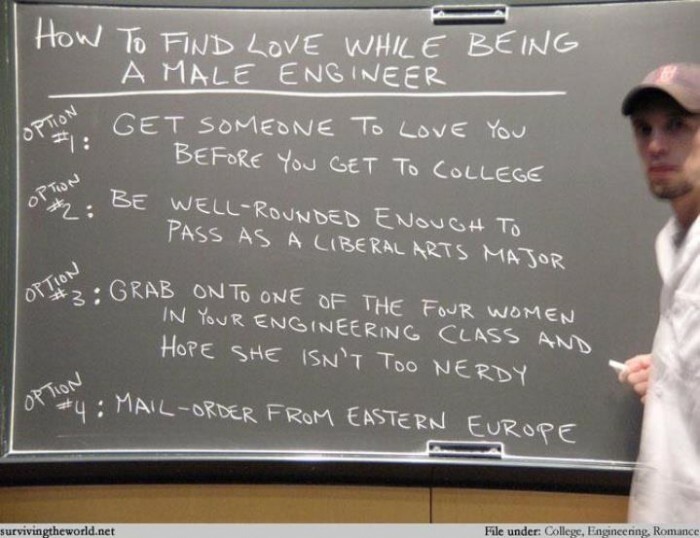 Problem with Option # 3 is that the three or 4 girls in an Engineering class are usually ogled by the 100+ other dudes. And they can be ugly as sin and as personable as doorknobs, but they’ll still have massive egos because they’re the only “chicks” most Engineering dorks will see on any regular basis for months at a time. Transfer to Texas A&M, join a frat or some bogus bible study group, tell women you’re an engineer…done. 4 outt 5 women @ Texas A&M go to find husbands. #5: Work for NASA, or other high profile\salary company. ‘build your own’ not listed..
waitaminit.. no engineer wrote this.